Meatball recipes vary according to personal tastes. They generally include ingredients like breadcrumbs, eggs and spices. Once you prepare and roll meatballs, you can steam, fry or bake them -- but baking meatballs prevents adding any additional grease or fat. After you bake homemade meatballs, toss them into spaghetti sauce, create a meatball sandwich or serve them as appetizers. Line two baking sheets with aluminum foil. Spray the foil with nonstick spray. Combine 3 lbs. of ground beef, 1 1/2 cups of dry breadcrumbs, a can of cream of mushroom soup, three lightly beaten eggs and 1/4 cup of grated Parmesan cheese in a bowl. Mix the ingredients well. Shape the meat mixture into balls that are 1 to 1 1/2 inches in diameter. Place the formed meatballs onto the baking sheets. Bake the meatballs in the oven for 30 minutes or until the internal temperature reaches 160 degrees Fahrenheit. Place a clean meat thermometer into the center of one or two meatballs to verify this temperature. Remove the meatballs and use them immediately while they are still warm. Freeze any leftover meatballs by allowing them to cool completely on the baking sheets. Place the baking sheets into the freezer for one to two hours, and then place the frozen meatballs into freezer bags. Remove the air from the freezer bags and seal them tightly. 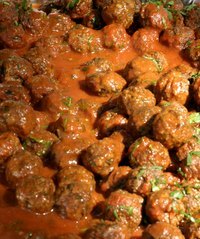 Wash your hands after handling the raw meatballs to prevent spreading harmful bacteria. Do not leave the meatballs sitting out at room temperature for longer than two hours because this will promote bacterial growth.